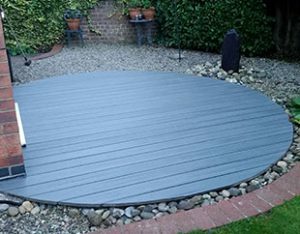 Searching for Decking Services York? 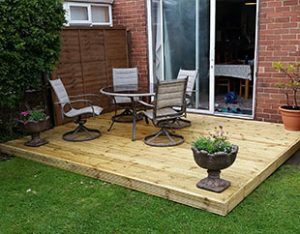 We offer a complete, affordable and professional Decking Services in York and surrounding areas. With years of experience we can design and build your dream deck. 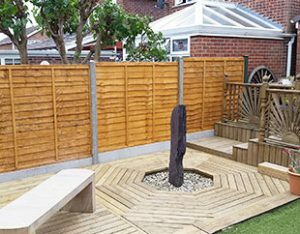 Timber decking is increasing in popularity and has become a fashionable addition to the garden. It is easy to see why as it benefits from being a relatively inexpensive way to create a patio area and requires little maintenance once it is completed. Decking is easily laid over your existing grass or patio. The ground is treated with weed killer and then a membrane laid to prevent further weed and plant growth. Unlike a stone patio, wood decking does not require extensive digging for foundations and support. Therefore your well-tended garden has minimal disturbance. 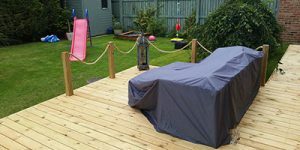 With a bit of planning decking areas can also help aid storage of your garden equipment. 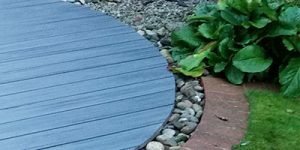 We provide a local garden decking installation service in York and surrounding areas. If you would like to discuss the options open to you, then please call us on 07878 256771 for a free no obligation consultation and quote. As our decking is built to your requirements, you have total control over costs and timescales. Why not also take advantage of our bespoke wooden outdoor stores, including log stores, bin tidys, gardening stores, plant boxes and composters. See our Garden Products Pages for more information. Most popular form of decking because it delivers a lovely warm feel to the outside space while being versatile and relatively cheap. All our decking is made from thick pressure treated (tanalised) timber and weather resistant screws/fittings are used to ensure your deck lasts. Different finishes are available from smooth to ridged. Non slip resin strips are also available. Composite Decking is becoming more popular due to the durability qualities it provides. Many suppliers offer a 25 year “Residential Fade and Stain Warranty” as a result. Composite Decks are easily maintained and require no maintenance such as annual treatment or paints. Made from 95% recycled materials it is considered to be more environmentally friendly as no trees are harvested for production. The downside is it is 3 times more expensive then standard timber decking. We offer a planning service which can be altered as many times as you feel necessary before work commences. 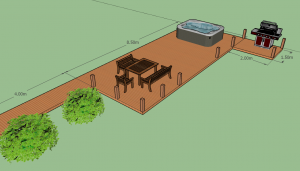 This allows you to visualise your deck and make the best use of the space provided. Matt did a superb job decking and fencing my garden. I can now rest assured my boy can play safely in the garden without any fear he will hurt himself. Highly recommended folks.